Widely adopted the world over, this text discusses solving reaction engineering problems through logic rather than memorization and the use of algorithms. The newest digital techniques, built on the sound foundations of the classic, best-selling text. With a combination of user-friendly software and classic algorithms, students learn to solve problems through reasoning rather than memorization. Thorough coverage of the fundamentals of chemical reaction engineering forms the backbone of this trusted text, presented in a framework that helps develop critical-thinking skills and practical problem-solving. All the classical elements are covered. 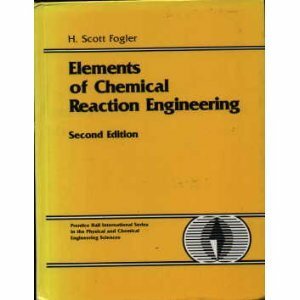 Elements of Chemical Reaction Engineering, Third Edition, builds a strong understanding of chemical reaction engineering principles and shows how they can be applied to numerous reactions in a variety of applications. The structured approach helps develop skills in critical thinking, creative thinking, and problem-solving, by employing open-ended questions and stressing the Socratic method. Throughout the text, margin icons link concepts and procedures to the material on the CD for fully integrated learning and reference. H. Scott Fogler is the Arthur F. Thurnau Professor, Vennema Professor of Chemical Engineering at the University of Michigan. His research interests include flow and reaction in porous media, fused chemical relations, gellation kinetics, and chemical reaction engineering problems in the petroleum industry. He has graduated 37 Ph.D. students and has more than 200 refereed publications in these areas. Fogler is the AIChE 2008 President-elect. He has chaired ASEE’s Chemical Engineering Division, served as director of the American Institute of Chemical Engineers, earned the Warren K. Lewis Award from AIChE for contributions to chemical engineering education, and received the Chemical Manufacturers Association’s National Catalyst Award. He is the co-author of the bestselling textbook Strategies for Creative Problem Solving, Second Edition (Prentice Hall, 2008).